Once these additional items are addressed, the Failover Cluster can function as expected. This bug during SQL 2008 Failover Cluster setup on Windows 2012 is documented here. With this bug, the radio button to choose "Use service SIDs" is completely missing. The workaround is to continue forward with the setup dialogue without making any selections. This causes setup to default to using Service SIDs. Thanks to Prashant Kumar for this solution. I have also verified this workaround is good. There are three additional steps to perform when installing SQL Server 2008 on Windows Server 2012. Please see this post for all three additional steps. To resolve error: "Rule "Cluster service verification" failed." the Failover Cluster Automation Server feature must be installed on each node. In Server Manager, expand Remote Server Administration Tools, expand Feature Administration Tools, expand Failover Clustering Tools, and then click to select Failover Cluster Automation Server. 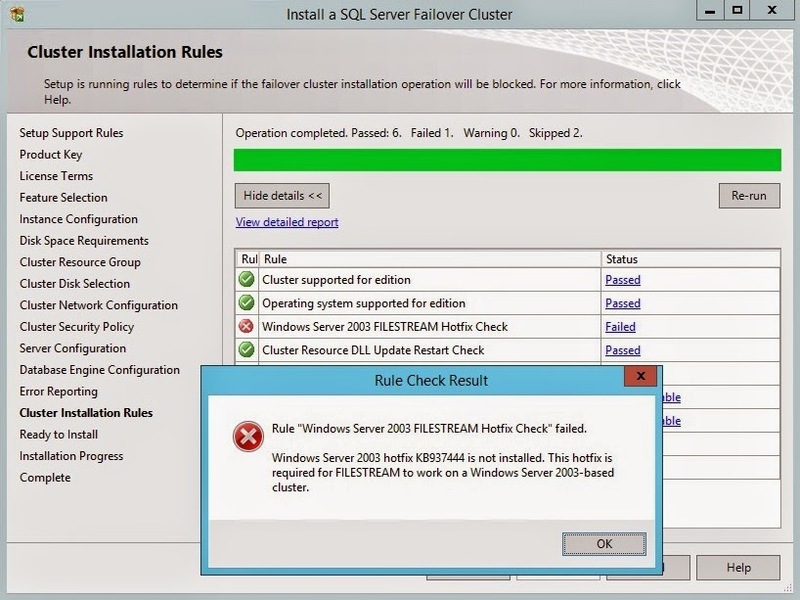 This error is seen even if you are not attempting to install FILESTREAM support in your SQL Server Failover Cluster. This Hotfix KB937444 is not valid for Windows Server 2012. To resolve you need to Slipstream the SQL Server service pack into your installation files. Error: "The log for database "x" is not available. Check the event log for related error messages. Resolve any errors and restart the database." The log for database "x" is not available. Check the event log for related error messages. Resolve any errors and restart the database. Run DBCC checkdb to make sure everything is good. Set Auto Close = False.